Whenever the Daily News Record contains an article about our Attorney General, it contains a rather dour-looking picture of him much like this one. I believe that if you knew nothing of Ken Cuccinelli, you would instantly dislike him solely based upon the above picture. Here is a rather stern man who is almost scowling. It is almost as if the picture says, “Oh no. Hide anything fun. Here comes Captain Killjoy!” Now I know that some of our liberal colleges likely view or would like to paint Attorney General Cuccinelli in such a light, but I believe that such a caricature is erroneous and shortsighted. One must remember that one of our Attorney General’s primary duties is to enforce the laws of the Commonwealth. Although doing so may make him unpopular in certain circles that is the task he is assigned to do and just because he does his job zealously we should not condemn him for doing so. Going back to our recent newspaper article, not only does it feature a less amicable picture of Ken Cuccinelli, the article is entitled, “Clinics Fear Closure”. Your gut reaction might be, “not our clinics! We need those!” When one reads the article however, fear gives way to reason. What Cuccinelli is suggesting is that abortion clinics in the state should be subject to the same medical scrutiny that hospitals undergo. Is this concept so fearful? Shouldn’t all clinics and medical facilities be subject to the same standards? If some facilities in Virginia are unable or unwilling to obey at least some minimal standard, then shouldn’t they be shut down? Should the Hippocratic oath be completely ignored in today’s day and age? Although some members of our community have sought to demonize or vilify Ken Cuccinelli, I know it stems from his willingness to fight for Virginia values and liberty. Unfortunately, most politicians have learned it is easiest to do nothing. After all, being ineffective ruffles no feathers and does not upset the status quo. Fortunately, our Attorney General is not such a leader. Sure, he is often a serious man, but it is not a somberness the average Virginian should fear. My concern is that if you only rely on surface scans of sources like the DNR you likely don’t know the real Ken Cuccinelli. 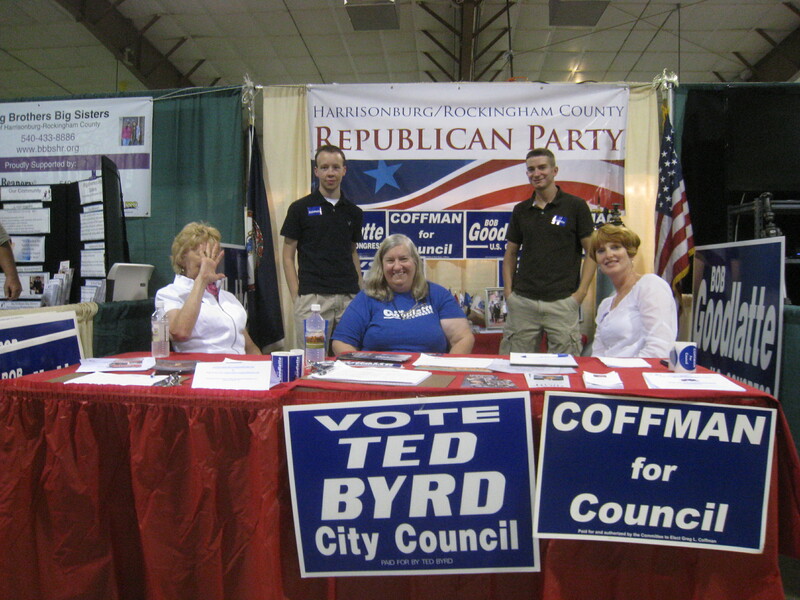 Growing up, I always enjoyed the Rockingham County Fair. 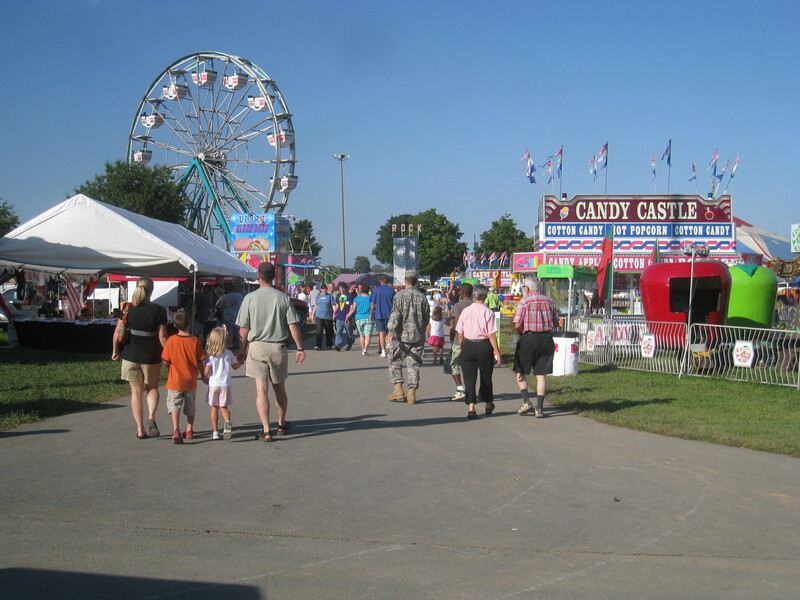 What kid wouldn’t enjoy the rides, the attractions, the food, the animals…and the politics? Ok, so maybe not every teenager cares about our government, but as you already know, I was a bit different. 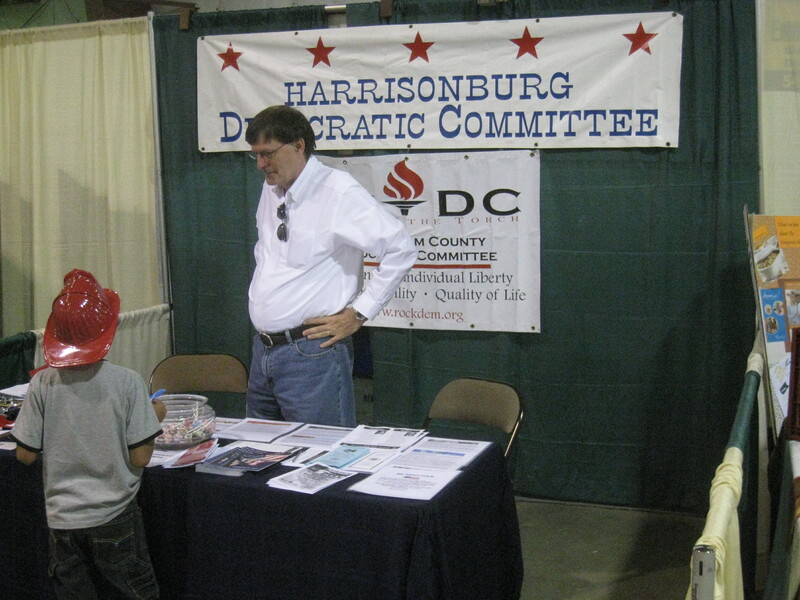 Anyway, each year the Harrisonburg and Rockingham County Republican Parties operate a booth at the fair to bring a little bit of the political world to the average citizens of the community. Every year I volunteered here once I became involved. More than anything else, I enjoyed standing behind that table handing out information to folks who stopped by, mingling with fellow conservatives. It was not a high-pressure sales job, but rather a chance to share a bit of our ideals, to shed light on this neglected facet of our society. Although I didn’t have much time to offer, I still gave about an hour this past week to continue my ritual. Below are a few photographs of the event. They are pretty self-explanatory. 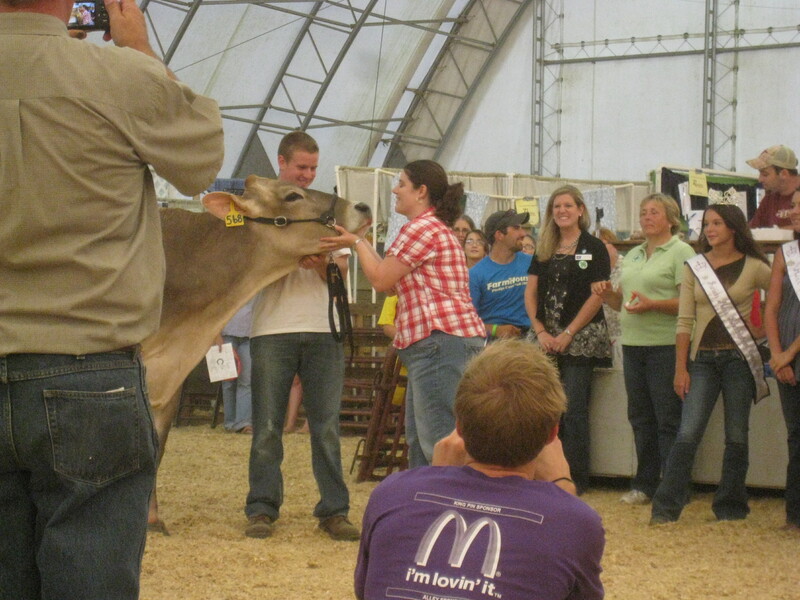 The last few are of the cow-kissing contest in which several public figures competed to raise money for the American Cancer Society. Hosting the event was Virginia Agriculture Commissioner Matt Lohr. In all, there were five people competing, including newly minted Delegate Tony Wilt (R-26) and Daily News Record Writer and author of the Bowser Bucket List, Heather Bowser. Thanks to these people who donated their time to such a worthy cause. Author’s note: Go back and read Part 1 and Part 2 if you haven’t done so yet. So, to take up where we left off, after my disappointment with the Connaughton Campaign, my work at Cooper & Secrest continued. However, I soon spoke to the head supervisor about working for a different part of the firm. After all, as I stated earlier, there are many different tasking in polling besides being a pollster. As a conservative, I couldn’t stand badmouthing conservative candidates to hapless voters. My supervisor replied that he would look into the matter and get back in touch with me. As a side note, although I didn’t talk to the head supervisor much, I always felt that he was a decent fellow and held out a small hope for some better future. Once I heard that news, I figured my days were numbered. While I anxiously continued to search for political employment, I got a job at Ash Lawn-Highland, the former home of President James Monroe. By comparison to Cooper & Secrest, that work was very engaging. Not only did I get to learn all sorts of interesting information about our fifth President, but also, as a tour guide, I had the opportunity to teach others about him. I wish some of our leaders today would take heed of the wisdom and philosophy of Monroe. And I haven’t even mentioned my co-workers. They were a mixed assortment of great folks who seemed to enjoy the work as much as I did. But to return to our main tale, all the while, I continued to work at Cooper. A month or so after getting this new job, one of my other supervisors, a man by the name of Jimmy, starting routinely harassing me after discovering my political leanings. They weren’t stereotypical partisan banter, but extremely hateful. For example, while walking through the office, he would stop at my station as say things like, “Where is the hood for your Klan outfit?” and “Been to any Nazi rallies lately?” He made my already bad situation far worse. In retrospect, I should have reported his behavior to the head supervisor, should have tried to get him fired. Maybe I should have even sued Cooper & Secrest for allowing his malicious conduct. Instead I took the coward’s path of shutting my mouth and trying vainly to pretend it didn’t happen. It didn’t help. Unfortunately, if you let someone degrade you in such a fashion once, they won’t ever stop. At first, I tried my best to avoid him. Once that tactic failed, I just stopped coming in to work at all. I couldn’t deal with it, couldn’t handle this new level of hell. Unfortunately, my work at Ash Lawn-Highland didn’t offer either enough hours or sufficient pay to allow me to live in Charlottesville once I left Cooper. Sadly, I trekked back across the mountain, to my hometown of Harrisonburg, desperately looking to put my Cooper & Secrest days behind me. As I might have stated earlier, the reason I blotted out this time from my resume was that I was fearful of the political repercussions. After all, how can a Republican organization trust someone who has more or less been employed by the Democrats? The main reason I bring it up now is to both inform and warn others. Fortunately, I believe my actions since that time have clearly and consistently proven my loyalty to my principles and that I was merely temporarily stuck in a quagmire. Thus ends my story of my days working for the enemy. I’m going to start off today’s post with a passage from the Bible. The lesson of widow’s mite (as the above passage is often known) is found both in the book of Luke and in Mark. I want you to consider the implications. Although we don’t know the exact amount, the passage seems to imply that, in terms of monetary value the rich people in the town gave far more than the widow could ever hope to give. And yet, Jesus tells us that she has given more than they. I know it would be tempting to praise the rich far more than the widow. After all, the Temple could make much greater use of the larger sum of money than two measly pennies. But then the point would be lost. Although we are told that the rich could afford to give far more, they chose an offering that they wouldn’t really miss, a small portion of their vast wealth. It was as if the rich were saying that they only valued God enough to give him a bit of their excess. The widow by comparison gave two coins, but it everything that she had. She had so little to offer however chose to give it all away for the sake of her faith. If we backtrack in Luke, we find another related passage, “Much is required from those to whom much is given, and much more is required from those to whom much more is given,” Luke 12:48 (NLT). I think that the message is clear. If we truly believe in God and his commandments, we should free give of our possessions and ourselves. Regardless of whether we are rich or poor, the spirit in which a gift is given is far more important that the actual amount itself. Although I know that some people don’t like to mix religion with politics, I hope you’ll permit me to draw a few parallels using the above verse in modern political thought. Through much hardship and struggle, our forbearers suffered much to claim for us the God-given freedoms that we enjoy today. Now a portion of our liberty has been lost over the years and, if we do nothing, we will lose far more. I know that a lot of you are quite busy and many of you do not have much money to throw around freely. Nevertheless, I wonder how much you value your freedom. Will you fight for it? Then will you donate your time and your money to make certain they are secure? And if you do, will your gift be just a small portion…time and money that you will not miss? I know that most political organizations make a big deal out of high dollar donors, but, in my opinion, those who truly believe in the cause and donate until it hurts are of far greater value. So what will it be? Are your God and your freedoms important enough to offer your first fruits? Or will they be a mere afterthought, assuming you give anything at all? Now, I’ll be the first to admit due to recent hardship that I have fallen short myself. Nevertheless, regardless of how rich or poor we are, like the widow, we must be willing to give our pennies and/or our hours for our religion and our politics. Otherwise, we show through our actions (or lack there of) that we neither value nor deserve them.